ANTI-WAR ACTIVIST Margaretta D’Arcy is due to be released later this morning from Limerick Prison. 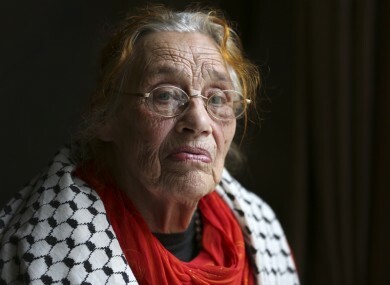 The 80-year-old activist had been jailed last year for unauthorised incursion into Shannon Airport and this month refused to sign a bond stipulating she would act lawfully and would not enter unauthorised zones at the airport again, resulting in further prison time. She served nine weeks in jail earlier this year for a similar conviction. Speaking to TheJournal.ie earlier this month, Dr John Lannon of ShannonWatch said the activist “doesn’t pose a threat to Irish society” and is highlighting things that do pose a threat. It is an outrage that a peace activist should be put in prison whilst there are war planes going through Shannon airport. The response of the Irish State is to put a peace activist in prison rather than inspecting these planes. D’Arcy will be released from Limerick Prison at 10am this morning. Email “Margaretta D'Arcy to be released from Limerick Prison”. Feedback on “Margaretta D'Arcy to be released from Limerick Prison”.